Movie: "Lu Over the Wall"/"Yoake tsugeru Rû no Uta"
Depressed middle schooler Kai makes digital music. He reluctantly joins a band that secretly practices on "Merfolk Island." While playing one day, their music attracts a young mermaid named Lu who changes their lives and the lives of everyone in their town. Music, magic, and mermaids. That's what you should expect to get in director Masaaki Yuasa's animated film "Lu Over the Wall." Masaaki Yuasa has also directed other movies like "Genius Party," "Mind Games," and "Night is Short, Walk On," though he is probably best known for his TV work. This story revolves around a middle school-aged boy named Kai who lives in a small coastal town with his father and his grandfather. Their town sits in the shadow of a giant rock wall in Japan, leaving the bay constantly in the shade, which makes the perfect conditions for merfolk to roam nearby since merfolk can't be in direct sunlight. Though they reside close to town, nobody ever sees them. Kai is depressed because his mom left him and now lives in Tokyo. He passes time by brooding while making music on his laptop. A couple of kids from school learn of his hobby and ask him to join their top-secret band Siren. Kai says no at first until he learns that they practice on Merfolk Island, where there is an abandoned amusement park. Kai is fascinated by the magical creatures that lurk there, so he reluctantly agrees. 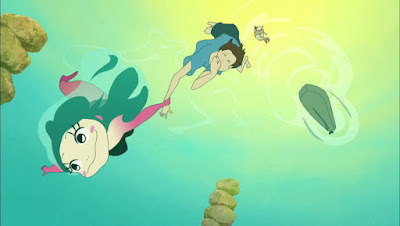 When the group practices for the first time, their music attracts a young mermaid named Lu, whose mermaid tail sprouts into legs when she hears their music. Little do they know it, but Lu is about to change the lives of Kai, his friends, and the whole town forever. 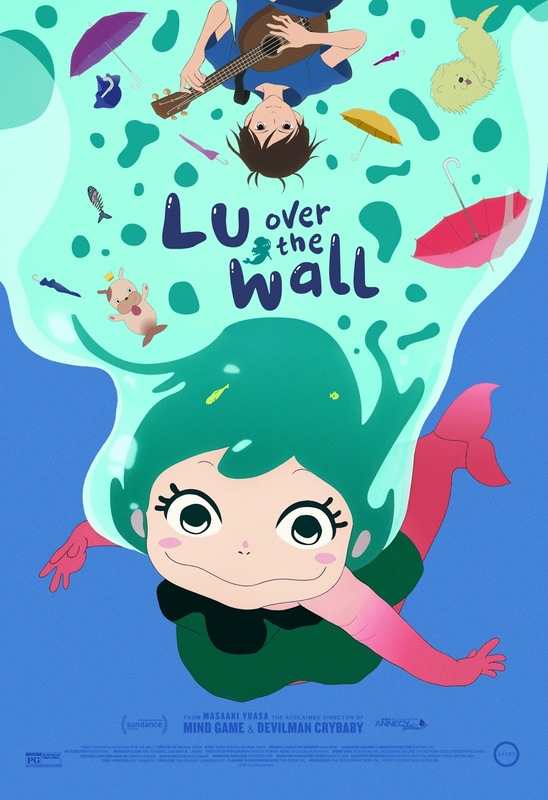 "Lu Over the Wall" is sort of weird even by Japanese animation standards. It has a lot of elements from the traditional anime style, but mixed in with it are bizarre, exaggerated body gestures similar to what you might see in a Ralph Bakshi film (except more child-friendly). This strange animation style kicks in whenever there is a musical performance, which seems to make people dance involuntarily. This is a very colorful, vibrant movie with several cute characters, great songs, and even a couple funny moments. 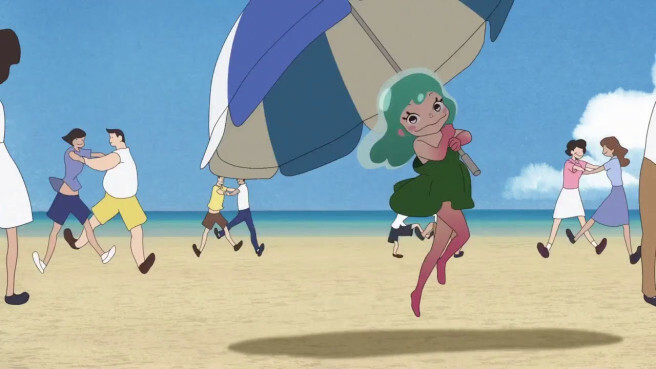 The character of Lu is absolutely adorable and reminds us of a Pokemon character mixed with the character Ponyo. The story is all about finding love and friendship in unexpected places and looking past differences. It also touches on the dangers of fanaticism, xenophobia, fearing those who are different, and the extreme dangers of fear-mongering and propaganda. We like all of these elements, but the movie is also poorly paced and feels much longer than it needs to be. It could have easily been 20 minutes shorter without impacting the narrative too terribly much. There are many parts that start to feel repetitive towards the end and there just isn't enough depth for each character to get us fully invested. In the end, "Lu Over the Wall" has a lot to like. It's super cute and is full of catchy music, but it's still one of the weaker Japanese animated films we have seen in a while. While it's not terrible by any means, we would have liked to see a bit more from this film.